2002, the Orbs have invaded New York. They came suddenly, like a thief in the night... it was all over by dawn. Outside communication has been suffocated and people have turned into slaves. Forced to wear brown robes, they can only walk in designated areas. Businesses have closed and are boarded up, buildings and streets are no longer maintained and vandalism is rampant. The sky is turning red and the air has a rotten odor. There are less and less people on the streets, fearing the aliens and their robots. Many have mysteriously disappeared. Every human has a tracking disk implanted in the neck, allowing the orbs to see their every move and act when a human goes out of line. However, while the tracking disk reveals a person's location, it does not reveal his identity. Hence the Orbs' need for Manhunters - human investigators - to track down the targets and find out what they are up to. 2004, you are a Manhunter. Every day you receive an assignment by the Orbs to track suspects and report their identities. You find out about the existence of a secret society, hiding underground to avoid tracking. The goal of the society: to drive the Orbs from New York by destroying their main structures. As such, you face a terrible dilemma: work for the Orbs and increase your chances of survival, or help the rebels to destroy the Orbs and risk a painful early demise? Manhunter: New York was the second collaboration between Sierra and the Murry family, following Sierra's publication of Evryware's Championship Boxing 5 years earlier. 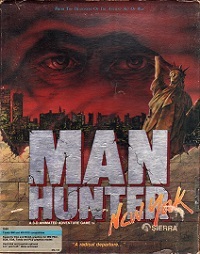 Manhunter: New York, which uses Sierra's AGI engine, is different from Sierra's other AGI adventures in that it uses a first-person perspective. Unlike the other AGI adventures, the game also does not use a text parser to insert commands - instead the bulk of the game is played by using the arrow and ENTER keys. Set in the future within a devastated city where murder and betrayal are commonplace, it is arguably also Sierra's first horror game. The story and puzzles are well-tought and the game also features multiple arcade sequences. the end of Manhunter: New York is also nicely set up for its sequel, which was released a year later and was the last Sierra game to utilize the AGI engine: Manhunter 2: San Francisco.